Below are a number of frequently asked questions (FAQs) about the practice of Agnihotra. For answers simply click on the relevant question. Can Agnihotra be performed at home? If I start Agnihotra in my house can any other family members perform it ? Which direction should I face when performing Agnihotra? What do you do with the pot and ash after Agnihotra? I can't do both morning and evening Agnihotra because of my work schedule, so should I be doing it at all? Why should ladies abstain from Agnihotra during the monthly period? It is difficult for me to practise Agnihotra at the times given. Can I practise another Yajnya instead? Agnihotra can be performed by anyone irrespective of religion, sect, caste, creed, nationality, colour, gender and age. Agnihotra is for everyone. Yes, Agnihotra can be performed anywhere in the house. Walls do not obstruct the flow of energy. It can also be performed on the balcony or on the terrace and even outside in the garden, on a farm or under a tree for example. Only one person should make the offerings in Agnihotra. Others can derive benefits by sitting opposite the Agnihotri. Two or more members of the same family can perform Agnihotra individually, but they should prepare fire and make offerings in separate Agnihotra pots - one pot for each person practising Agnihotra. There is always a difference between visible and true sunrise/sunset timings. This difference is due mainly to a refraction effect (bending) as the sun's rays enter the relatively dense atmosphere of the earth. 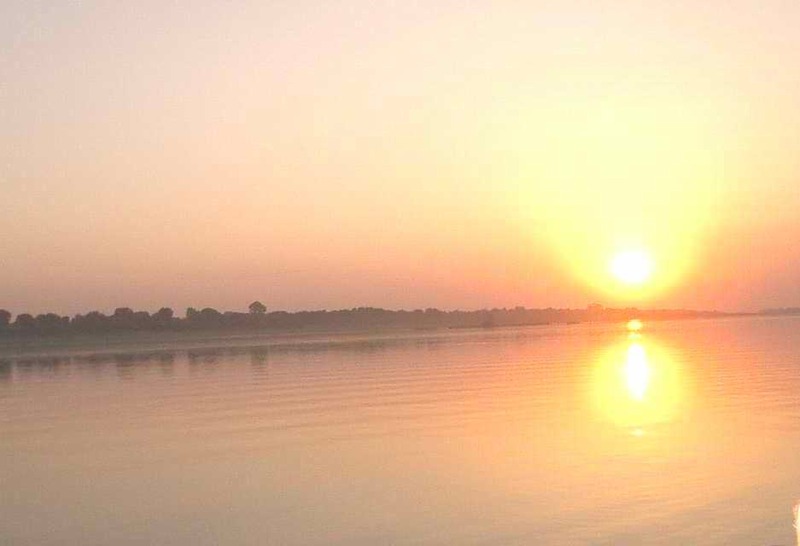 There are several definitions of sunrise/sunset given in Veda. For Agnihotra the definition used is sun's position one and a half discs above the horizon when the refraction effect is taken into account. Practically speaking this means that at sunrise the sun will appear to have already risen at the correct timing of Agnihotra. And at sunset the sun will appear to have not yet set at the correct timing. The difference in time between the visible and true timings may vary by up to as much as 5 minutes. Computer generated timetables for whole year for any particular place are available up to seconds accuracy using software developed in Germany. Yes, if for any reason you cannot perform Agnihotra, then any other family member or friend can perform it. Even children under supervision can perform it. No. Use of Om in the Mantra for this particular small Agnihotra is not required. No change of any kind should be made in the Mantra as originally given. No. Agnihotra Mantras are given in Vedas in Sanskrit language. They are special sound combinations. They are unique in their vibrational effect. It is this vibrational aspect which provides the healing power. To render the Mantra in any other language would destroy this vibrational effect and hence nullify the power of Agnihotra. Cow's ghee is a unique substance with properties unlike any other known material. Ghee from other animals such as the buffalo or goat will not only fail to produce the same beneficial healing result, but may produce a negative effect. Other medicinal herbs may be used in other Yajnyas but not for Agnihotra. There is no strict requirement about which direction you should face when performing Agnihotra. If it is possible to determine the direction, then you can face east at sunrise and sunset. It is also possible to face west for sunset Agnihotra. This directional aspect merely enhances the Agnihotra effect but it is not compulsory. No. If regular practice of Agnihotra is stopped or interrupted for any reason there will be absolutely no bad effect as a result. Only the beneficial effects which derive from its regular practice will cease. Start by placing a piece of dried cow dung flat in the bottom of the pyramid. Add two small pieces in opposing corners. Continue adding pieces in alternating corners, using bigger and bigger pieces as the pile grows. Ghee can either be spread on each piece before adding to the pyramid or the ghee can be poured over each layer as you build. If you want, you may prepare a larger fire by continuing to stack the dung pieces above the top of the pyramid, but use smaller pieces to make the stack more stable. To light the dung, spread some ghee on a narrow piece of dung, ignite it and stick it down the "chimney" created by the layers of dung. The air flow will give you a blazing fire which won't collapse as it burns. The quantity of rice which can be held in the fingers of one hand constitutes one portion. Apply a little ghee to the body of rice and divide into two portions. Exactly at sunrise and sunset utter the first Mantra and add the first portion of rice as you say the word "Swáhá". The rice and ghee is given to the fire with thumb between middle and ring fingertips and index and pinkie fingers out straight. From the heart move the hand towards the fire and drop the rice and ghee mixture in the blazing, central hole. The right hand only should be used since the right hand gives energy, the left hand takes energy. Then utter the second Mantra and give the second portion of rice. All the ingredients in the pyramid should be consumed by the fire leaving only ash. After the Mantras are uttered and the offering made you can sit quietly until the fire subsides naturally. Never try to extinguish the fire. The pyramid should always face the same direction. This is possible by scratching the underside of one lip of the pyramid with a sharp object. This scratch can be felt and used to orient the pyramid in the same direction each time. Concentrate fully on Love, your Guru, Light, the flames or whatever you perceive as pure. If possible the Agnihotra pyramid and the energy resulting from the Agnihotra process is best left undisturbed until the next Agnihotra time. Just before the next Agnihotra you can empty the ash using your right hand and store it in a bag, box or clay pot. Never clean or scratch the inside of the pyramid. The ash from the Agnihotra fire is extremely medicinal. It can be ingested daily. Several ash medicines have been developed in Germany. The ash is also a powerful fertilizer for the garden or farm and beneficial in any water source to purify the water. After uttering the Mantra and giving the offering to the fire Agnihotra is complete. You can now go about your business. However, it is good if possible to sit quietly for a few minutes until the flames subside. If you are in the habit of practising meditation or any other spiritual discipline then the atmosphere created after performance of Agnihotra is ideal and conducive to these pursuits. Whenever Agnihotra is done correctly, it will have effects. It's like taking a vitamin - the more regularly you take it, the greater the benefit will be, but it will have effects whenever you take it. Many people who now do Agnihotra regularly started by doing Agnihotra whenever they could. If you live in a very large city, your telephone directory should have a listing for Time, and that time service should provide correct time to the second. If not, you can tune to BBC radio or your local national radio broadcaster. If you have a computer there is a program you can use to set your PC's clock, which will keep it updated every time you go online. This clock shows Indian Standard Time which is five hours thirty minutes ahead of GMT. For 4 days from the commencement of the menstrual period ladies should abstain from practice of Agnihotra. During this 4 day period the energy of the woman spirals in a downward direction, opposite to the rest of the month. This is incompatible with Agnihotra energy which always spirals in an upward direction. No. It is not necessary to adopt a vegetarian diet before starting to practise Agnihotra. However, many people have discovered that after practising Agnihotra regularly for some time they feel less attracted to a non-vegetarian diet. No. Agnihotra Mantras are to be recited only once and only two offerings given at each Agnihotra performance. No. Agnihotra is the basic Yajnya which initiates the healing cycle. It must first be practised regularly before attempting to practise any other Yajnya. Agnihotra and the other Yajnyas are powerfully transformative processes. Agnihotra first creates a healing vibration on the whole body which makes the practice of other Yajnyas problem-free. It is not necessary to clean the Agnihotra pyramid. The gradual accumulation of ash on the inside of the pot does not adversely affect the Agnihotra vibration. In fact by cleaning the pot you may inadvertently disturb the crystalline structure of the copper atoms which would definitely interfere with the Agnihotra vibration.